"Fells" redirects here. For the surname, see Fells (surname). For other uses, see Fell (disambiguation). The English word fell comes from Old Norse fell, fjall (both forms existed). It is cognate with Icelandic fjall/fell, Faroese fjall, Danish fjeld, Swedish fjäll, and Norwegian fjell, all referring to mountains rising above the alpine tree line. 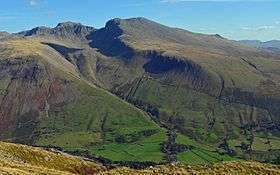 In Northern England, especially in the Lake District and in the Pennine Dales, the word "fell" originally referred to an area of uncultivated high ground used as common grazing usually on common land and above the timberline. Today, generally, "fell" refers to the mountains and hills of the Lake District and the Pennine Dales. Names that originally referred to grazing areas have been applied to these hilltops. This is the case with Seathwaite Fell, for example, which would be the common grazing land used by the farmers of Seathwaite. 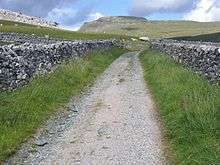 The fellgate marks the road from a settlement onto the fell (see photograph for example), as is the case with the Seathwaite Fell. In other cases the reverse is true; for instance, the name of Wetherlam, in the Coniston Fells, though understood to refer to the mountain as a whole, strictly speaking refers to the summit; the slopes have names such as Tilberthwaite High Fell, Low Fell and Above Beck Fells. The word "fell" is also used in the names of various breeds of livestock, bred for life on the uplands, such as Rough Fell sheep and Fell ponies. It is also found in many place names across the North of England, often attached to the name of a community; thus the township of Cartmel Fell. In northern England, there is a Lord of the Fells – this ancient aristocratic title being associated with the Lords of Bowland. Groups of cairns are a common feature on many fells, often marking the summit – there are fine examples on Wild Boar Fell in Mallerstang Dale, Cumbria, and on Nine Standards Rigg just outside Kirkby Stephen, Cumbria. As the most mountainous region of England, the Lake District is the area most closely associated with the sport of fell running, which takes its name from the fells of the district. "Fellwalking" is also the term used locally for the activity known in the rest of Great Britain as hillwalking. The word "fell" also enjoys limited use in Scotland, with for example the Campsie Fells in Central Scotland, to the North East of Glasgow. 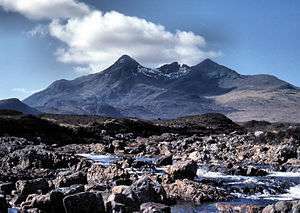 One of the most famous examples of the use of the word "fell" in Scotland is Goat Fell, the highest point on the Isle of Arran. Criffel and the nearby Long Fell in Galloway may be seen from the northern Lake District of England. Peel Fell in the Kielder Forest is situated on the border between the Scottish Borders to the North and the English county of Northumberland to the South. In Norway, fjell, in common usage, is generally interpreted as simply a summit of greater altitude than a hill, which leads to a great deal of local variation in what is defined as a 'fjell'. Professor of geography at the University of Bergen, Anders Lundeberg, has summed up the problem by stating that "There simply is no fixed and unambiguous definition of 'fjell'." Ivar Aasen defined fjell as a "tall berg", primarily referring to a berg that reaches an altitude where trees don't grow, lower berg are referred to as "berg", "ås" (hill, ridge) or "hei" (moor, heathland). The fixed expression til fjells refers to mountains (or uplands) as a collective rather than a specific location or specific summit. According to Ivar Aasen berg refers to cliffs, bedrock and notable elevations of the surface underpinned by bedrock; berg also refers to the substance of bedrock. For all practical purposes, 'fjell' can be translated as 'mountain' and the Norwegian language has no other commonly used word for mountain. In Sweden, "fjäll" refers to any mountain or upland high enough that forest will not naturally survive at the top, in effect a mountain tundra. 'Fjäll' is primarily used to describe mountains in the Nordic countries, but also more generally to describe mountains shaped by massive ice sheets, primarily in Arctic and subarctic regions. In Finnish, the mountains characteristic of the region of Lapland are called tunturi (plural: tunturit). In Finnish, the geographical term vuori is used for mountains recently uplifted and with jagged terrain featuring permanent glaciers, while tunturi refers to the old, highly eroded, gently shaped terrain without glaciers, as found in Finland. (Also, tunturi is used to refer to treeless plains at high altitudes in far north regions, as well.) They are round inselbergs rising from the otherwise flat surroundings. The mountains in Finnish Lapland reach heights of up to 400 and 800 metres, where the upper reaches are above the tree line. Those that do not reach the tree line, on the other hand, are mostly referred to as vaara. The mountains in Finnish Lapland form vestiges of the Karelides mountains, formed two billion years ago. The term tunturi, originally a word limited to Far-Northern dialects of Finnish and Karelian, is a loan from Sami, compare Proto-Sami *tuontër, South Sami doedtere, Northern Sami duottar, Inari Sami tuodâr "uplands, mountains, tundra", Kildin Sami tūndâr, which means "uplands, treeless mountain tract" and is cognate with Finnish tanner "hard ground". From this Sami word, the word tundra is borrowed, as well, through the Russian language. The term förfjäll (literally "fore-fell") is used in Sweden to denote mountainous zones lower and less dissected than the fell proper. On the other hand, its more pronounced relief, its often higher amount of plateaux and its coherent valley systems distinguishes the förfjäll also from the undulating hilly terrain (bergkullsterräng) and the plains with residual hills (bergkullslätt). Generally the förfjäll do not surpass 1000 m.a.s.l. As a geomorphic unit the förfjäll extends across Sweden as a 650 km long and 40 to 80 km broad belt from Dalarna in the south to Norrbotten in the north. Look up fell in Wiktionary, the free dictionary. 1 2 Falk and Torp (2006:161). ↑ Bjorvand and Lindeman (2007:270–271). ↑ Tufto, Jon. "- Fløyen er ikke et fjell". bt.no. Retrieved 2012-07-13. ↑ Aasen, Ivar (1918): Norsk ordbog med dansk forklaring. Vestmannalaget/Cammermeyer. ↑ Aikio, Ante (2009). The Saami Loanwords in Finnish and Karelian. Oulu: unpublished dissertation. p. 283. Retrieved 22 January 2016. ↑ Aapala, Kirsti. "Tunturista jängälle". Kieli-ikkunat. Archived from the original on 2006-10-01. Retrieved 2009-11-29. ↑ Itkonen, Erkki (1945). "Tanner, tunturi, tundra (Zusammenfassung: Finn. tanner 'Feld', tunturi 'Fjell, hochgelegene Bergfläche (im hohen Norden)' und tundra 'Tundra')". Virittäjä: 384. ↑ Terrängformer i Norden (in Swedish). Nordiska ministerrådet. 1984. p. 10.